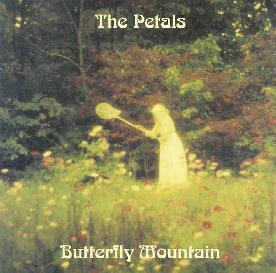 The Petals - "Butterfly Mountain"
Tony Dale has been doing quite a public service via his Camera Obscura imprint by bringing attention to really great long-running ensembles that have suffered from under-appreciation, such as Green Pajamas, Black Sun Ensemble, and this Milwaukee group, which has been around since 1988. This is the first release by these folks in nine years, and it’s a picture-perfect slice of that mid 80’s era paisley psych rock. Like much of the music of that period, this is "psychedelic" more in vibe than in an overtly soaked sense. That is to say, there are no backwards guitar solos or 20-minute jams, but instead plenty of (mostly) upbeat jangly rock songs with absurd/surreal lyrics and a judicious use of atmospheric reverb. Sample lyric (from the song Living Room) "The walls are talking to me/the carpet says hello/the doorway says I miss you/the windows say I know" should tell you a bunch about where these folks are coming from. The songs are great, personal fave is probably the closer "Neutron Star", which is fleshed out with some sitar playing from John Frankovic (from Plasticland, another great and oft ignored band that is due for a re-evaluation) and Jeff Hamilton (dunno where he’s from but he plays well!). But it’s all good stuff, fans of the genre should approve! For more information you can visit the Camera Obscura web site at: http://www.cameraobscura.com.au. Contact via snail mail c/o Camera Obcura; PO Box 5069; Burnley VIC 3121; Australia.